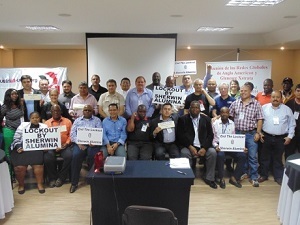 Nov 20, 2014 In what can be described as a significant moment in IndustriALL’s mining sector, a Glencore global network was launched in Sao Paulo this week. The global network committed to a mobilization programme. The country reports from the 32 delegates representing IndustriALL affiliates from 14 countries were a testimony of “the consistent brutality and disrespect for workers’ and unions’ rights displayed by Glencore throughout its operations, all of which are in clear contrast to the public mirage created by its public relations machines,” said Andrew Vickers, Chair of the Mining Sector and General Secretary of the Construction, Forestry, Mining and Energy Union (CFMEU) of Australia. SL Garment has dropped legal charges against C. CAWDU leader, Ath Thorn, and other unionists in a new agreement. 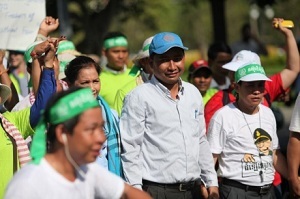 Nov 20, 2014 Cambodian garment union and IndustriALL Global Union affiliate, C.CAWDU, has won a key victory in settling a long-running dispute with clothing manufacturer SL Garment. In the settlement, signed between C.CAWDU union leaders and SL Garment on 17 November, the company agrees to drop all charges against union leaders and activists. SL Garment will also pay US$ 300,000 to all current employees who took part in strikes against the company in 2013. SL Garment will pay the money directly to the employees after checking the list of eligible staff with the trade union. Representatives from C.CAWDU and the Ministry of Labour will witness and observe the distribution of the money to employees. SL Garment’s parent company, JD United, is an important supplier for US fashion brand GAP. C.CAWDU President, Ath Thorn, who was one of the union leaders facing charges by SL Garment, said that pressure on GAP made the brand exert its influence over its supplier to achieve the settlement. SL Garment has also agreed that company shareholder, Meas Sotha, who hired military police that attacked workers during the 2013 strikes, will not be involved in the daily operations of the employer or the daily management of the factory. The November 2014 agreement follows a settlement made between C.CAWDU and SL Garment in December 2013. In it, the company had promised to drop all charges against union leaders. However, it reneged on the deal just a few months later. IRAN – IndustriALL talks to Jamshid Ahmadi an Iranian activist. Click here to see the interview. Nov 20, 2014 Watch this IndustriALL Global Union video about the violations faced by workers in Iran and their struggle to create independent trade unions in a country where they are banned. says Kemal Özkan, IndustriALL’s Assistant General Secretary. Iran is an important country in the MENA region in the gas, oil and manufacturing sectors. However, there is little respect for fundamental human and trade union rights. 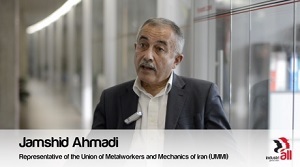 IndustriALL speaks to Jamshid Ahmadi an Iranian activist working with the Union of Metalworkers and Mechanics of Iran (UMMI). He helps to raise international awareness of UMMI’s activities and forge links with independent trade unions globally. In Iran, arrests and detentions take place on a regular basis; workers are frequently arrested for supporting the right to organize workers and for building independent trade union structures. Torture is routinely used to extract confessions, and political prisoners are systematically denied medical care. In June, the ILO Committee on Freedom of Association upheld an ITUC/ITF complaint over the illegal repression of the bus drivers’ trade union headed by Mansour Osanloo who was finally released from jail. 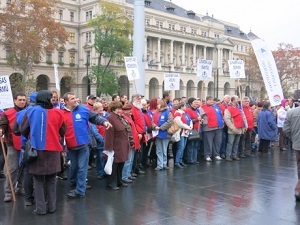 Trade union rights are severely limited and strikes are prohibited. Reports suggest over 70% of Iranian workers are employed on temporary contracts, with no job security. 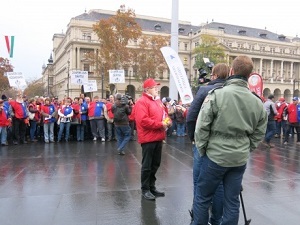 Nov 19, 2014 On 17 November, IndustriALL Global Union affiliate, the Hungarian Metalworkers’ Federation (VASAS), staged a protest in Budapest in front of the Parliament to prevent a new austerity drive. At least one thousand workers came to the streets and raised their voice against the government’s plan to increase taxes on fringe benefits from 35.7 per cent up to 51.17 per cent, while at the same time lowering the maximum possible annual amount of this allowance paid by the employers. The government did not consult their social partners about suggested amendments in advance, and workers’ representatives only learned about the planned rise through the mass media. The planned tax increase would affect in a very negative way many households as fringe benefits are a very important and essential part of income for many Hungarian families. Other IndustriALL affiliates, including the Federation of Building Material Workers’ Unions, the Federation of the Chemical, Energy and General Workers’ Union, and the Mining and Energy Workers’ Union – BDSZ-Mining, joined the protest. According to VASAS, while the protest was still going on, the leader of the parliamentary group of the ruling party Fidesz announced that they would not support the government’s plan. Although it happened on the same day, the union action was not directly linked to the “Public Outrage Day” in Budapest involving more than 10,000 people who gathered in front of the Hungarian Parliament demanding the dismissal of the head of the tax authority accused of corruption, and a higher level of accountability of the Prime Minister Viktor Orban’s government. The demonstration was successful. Two days later, on 19 November, Parliament voted against increasing taxation on fringe benefits. Nov 17, 2014 Two hundred Polish miners are occupying the headquarters of the European Union’s largest thermal coal producer in protest at plans to liquidate t he firm. Liquidation of Polish mining giant, Kompania Weglowa S.A. (KW), would threaten the jobs of more than 46,000 workers employed by the state-owned company. 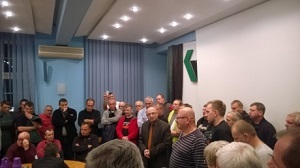 The protesting miners, which include members from IndustriALL Global Union affiliates KADRA and Solidarnosc, have been camped out in the company’s Katowice-based offices since last Thursday. They are refusing to leave until they can meet and hold talks with representatives from the Labour Ministry. They want the Polish government to intervene and save the company, which has already been under a restructuring plan to reduce the workforce by 26,000 employees. Over ten thousand jobs have been shed in the past two years. However, last week KW’s CEO, Miroslaw Taras, told union representatives that he had been unable to obtain finance for restructuring the company after plans to raise millions of dollars by issuing eurobonds fell through. The CEO told unionists that his only option to save the company was to dismiss mining crews and liquidate several mines. He also said that he had returned from the Polish capital Warsaw without any government support. The company faced a similar financial crisis ten years ago. The government came to the rescue after miners occupied KW’s headquarters. A statement published today by a coalition of Polish unions, criticized the government over its inaction and for downplaying the problems at KW.